So useful. I’ll put this into action soon. Where should I buy a 74hc86? Just tried it with the schmitt gates and it works perfectly, but i want it on a switch so i am going to keep trying. Sweet! I’d order a kit. It’ll be nice to have a DMG inverted twice without messing with each ROM. Bibin: I don’t know… There’s a student lab at my university where companies have donated circuits through out the years. We have a drawer full of just different 74hc circuits. I suggest you settle for the 74hc04 version, since 74hc04 is way easier to find than 74hc86. As NeX said btw, a schmitt triggered gate will work too, 74hc14. They are the same pinout, and equivalent when used like this. In fact, if I do a kit, I’ll probably go for 74hc04, since I couldn’t find any surface mount 74hc86’s. If you really want a switch, you could use a 74hc04 + a DPDT switch to choose between the two. Amazing work. I love it! Just tried it with the 74hc86 chip and again works perfectly! i ordered a minimum order of 4 chips, so i think a lot of other gameboys are going to get this mod. This video literally just gave me a hard-on. Hey so do i just need to add a switch to the ground to make it reversable? 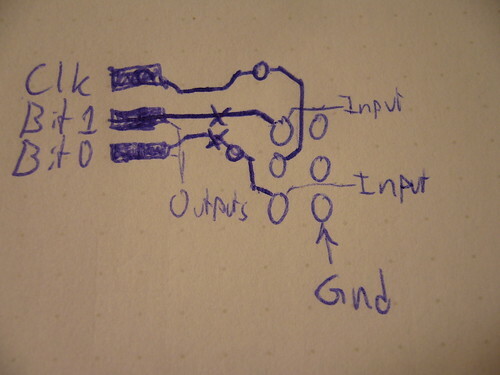 You do need the pullup resistor to +5V as well, but yes. (The value of this resistor can safely be increased to 10 kohms or more for a slightly lower power consumption.) This assumes you’re using the 74hc86 (quad xor chip). If you just want to invert the screen without a switch, use the 74hc04 chip instead. 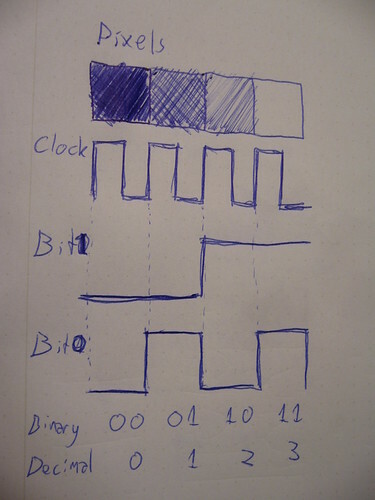 Why not just invert the one clock signal instead of inverting two bit signals? is there anything wrong about that? or will it have issues cause it’s now 180° phase? Tyler: The drawing just shows what the signal would look like if four pixels with the four possible values would be clocked out consecutively. All the clock signal does is tell the LCD when there’s new pixel data on the data lines. Inverting the clock would just make this happen half a clock later, and the most you could possibly achieve with this is to shift the whole LCD image one pixel to the left. Oh… silly me. I’m not too keen on how things operate when it comes to electronics. I know very little from building lunetta synths and modding a c64 for use with MSSIAH. As you rightly assumed, I was basing this off your drawing. thanks for the clarification. 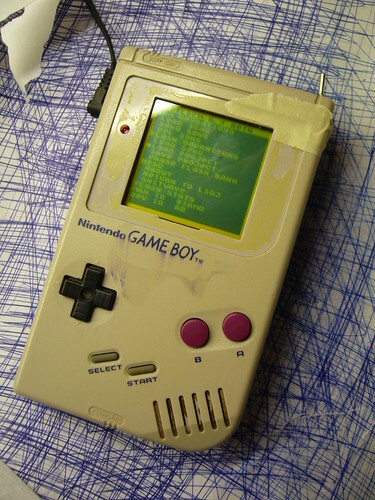 One quick thing while it’s on my mind, I was reading the comments on Michael Moffitt’s tutorial page about this mod and there are two folks that claim they broke their gameboys trying this mod. Is this mod honestly safe when installed properly? I have confidence in my soldering, but these comments have made me cautions. I’ve never experienced this. 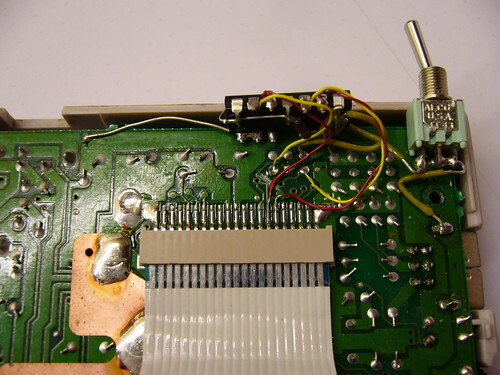 The only non-trivial way I could see this happening if the soldering was done flawlessly, is if the traces were not properly cut so that the input and output of the inverter chip were shorted. This could cause the inverter to start oscillating really quickly, which wouldn’t be good for the LCD, or the DMG CPU for that matter. So test with a multimeter in continuity mode that the trace is really broken. Then scratch some more. Of course, the usual caution applies. Make sure the chip is correctly oriented and doesn’t press against something in such a way that it causes a short. Also make sure that all connections are good before powering up. And while we’re at it, never connect or disconnect the ribbon cable while the Gameboy is powered on. It’s very easy to accidentally connect the LCD drive voltage (-19V) to one of the button inputs, which will kill the left and B buttons. And obviously, be careful when peeling the layer off the LCD. what did i wrong . could you do some drawing ore somthing to get the problem fixed ! Thanks for your work, it’s an interesting blog. 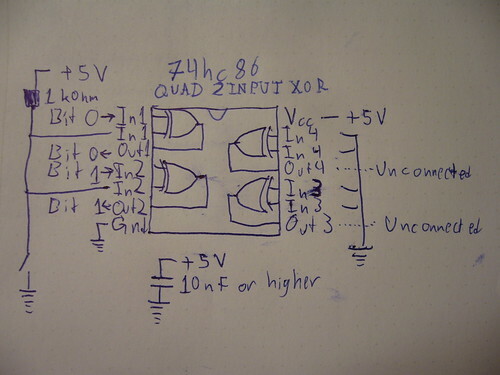 I want to use an 74HC04 inverter but actually I don’t know if Vcc should be 5V or 3.3V, what should I take into account? or should it always be with 5V? Vcc should be what it is in the rest of the system. 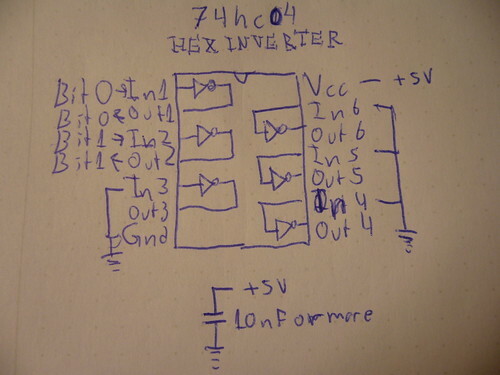 In this case 5V. You should not add a 3.3V regulator or anything like that. 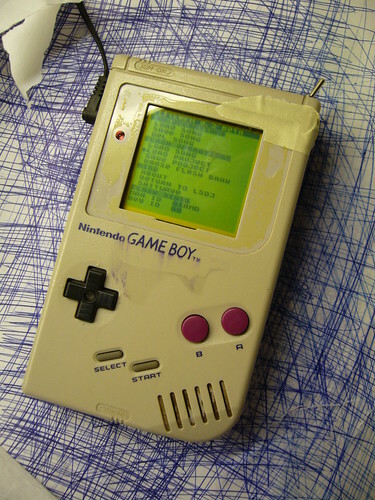 This page was previously hosted on http://gameboygenius.8bitcollective.com/wordpress/2009/11/23/how-to-patch-your-dmg-to-use-a-biverted-palette/ (*).